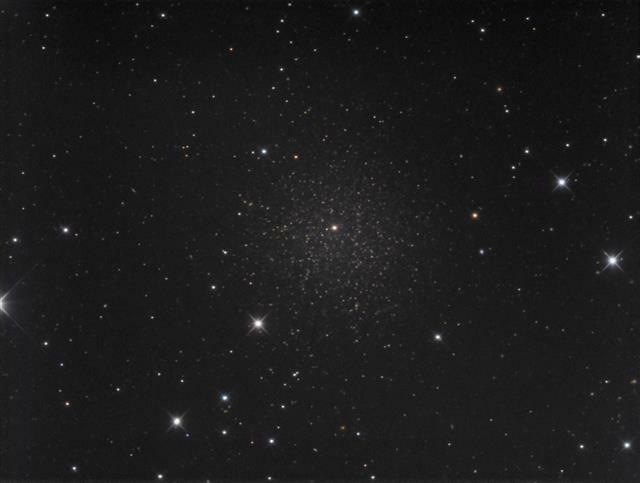 Last April, this column profile the dwarf spheroidal galaxy Leo I, discovered by chance in 1950 by astronomers Robert Harrington (still no relation!) and A.G. Wilson as they were scanning the Palomar Sky Survey. I ended that column saying that "Using the right eyepiece and knowing the field will help you add this dwarf spheroidal to your list of conquered challenges with comparative ease. But don't get too cocky. Spotting its sibling, Leo II is an even greater challenge. But we will leave that for a future column." We are back to follow in the footsteps of Harrington and Wilson. Their paper Two New Stellar Systems in Leo (Publications of the Astronomical Society of the Pacific, Vol. 62, No. 365, p. 118, 1950) announced the discovery of a pair of dwarf spheroidal galaxies within Leo. They christened the second, more difficult one Leo II. You may know it by its designation UGC 6253 in the Uppsala General Catalog. 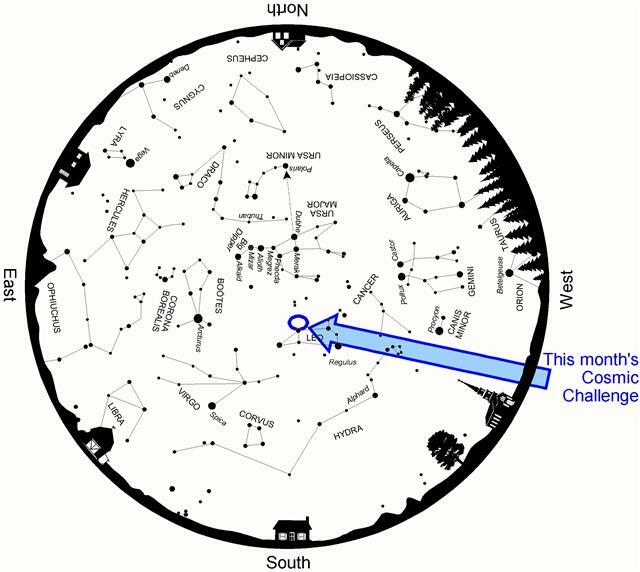 In 2007, a team of Japanese astronomers using the 8.2-meter Subaru Telescope atop Mauna Kea, Hawaii, found that, like Leo I, Leo II is dominated by old stars and very little interstellar gas and dust. Their results showed that the stars in the outer portions of the galaxy contain very little metal. The lower the metal content in a star, the older it is assumed to be, since metals are only formed in the cores of massive stars. When those stars explode, their metallic cores seed nearby nebulae, ultimately to end up in future generations of stars. The stars in Leo II, lacking those metals, are thus considered to be old. Interestingly, however, stars towards the inner regions of the galaxy show a greater abundance of metals, and so must be comparatively young. From this, the astronomers concluded that most stars in Leo II formed about 8 billion years ago, and that the process started from the outside and moved in toward the center. It ceased some 4 billion years ago, except, strangely, at the very center of the galaxy. To pin down this second dwarf spheroidal, start at Zosma [Delta (δ) Leonis] at the tail end of the lion. 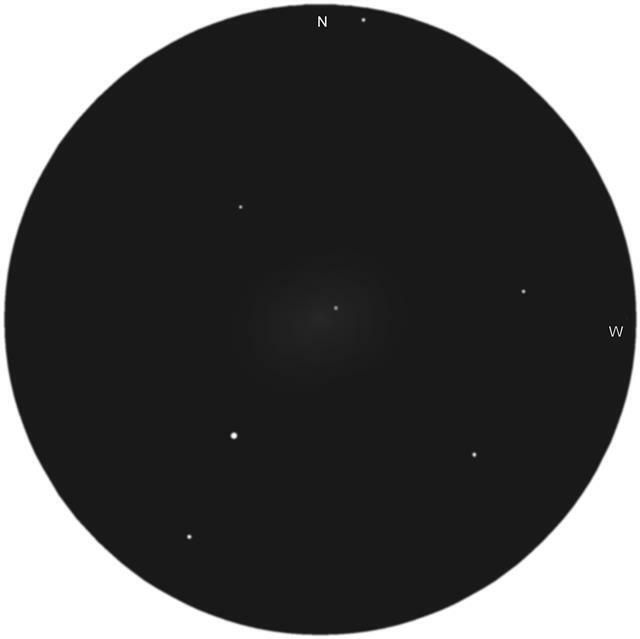 Viewing through your finder, hop a degree north-northeast to an 8th-magnitude star and then another 45' farther still to a pair of close-set 9th-magnitude suns. With an eyepiece producing about a half-degree real field, slide those two stars toward the eastern side of the view. As you do, a reddish 8th-magnitude star should slip into the western edge. In between, look for an asterism of 11th- to 13th-magnitude stars that resemble the bright stars of the Pleiades -- that is, a tiny, short-handled dipper. The bowl is aimed toward the south, while the handle extends northward. Using this tiny dipper pattern as a guide, look 4' northwest of the handle star for a soft glow. That's Leo II. Above: Leo II as sketched through the author's 18-inch (45.7cm) reflector. It took several failed attempts before I finally located Leo II through my 18-inch telescope on an especially clear evening several springs ago. At 171x, it appeared as a very faint, oval disk extending perhaps 6'x4', or about half of its full size in photographs. Increasing magnification to 206x revealed a brighter core at the heart of the galaxy that went unnoticed at the lower power. Compare my sketch to this outstanding photo taken by CN moderator Dan Crowson from O'Fallon. MO. His end result is a compilation of images taken on March 1, March 2, and April 29, 2016, from Rancho Hidalgo in Animas, New Mexico. He used a SBIG STF-8300M camera through a 12-inch (30cm) f/8 Astro-Tech AT12RCT Ritchey-Chrétien reflector. Above: Leo II as imaged by Dan Crowson, www.crowson.com. If you look carefully, you'll see that he also caught a faint asteroid superimposed on the lower right edge of the galaxy. A discussion in the CN forums back then tentatively identified it as (27223) 1999 GC5 at magnitude 17.5. Thank you for your entry, Phil ! I like your Cosmic Challenge book as it challenges me to see things in the night sky with smaller aperture than I thought would be possible. Your entries make me a better observer. After reading about it in Phil's book, I tried to see it and was successful in my 10-inch SCT. Now I've seen Leo I, Leo II, and Leo III! Sweet. That's great! Leo III (or if you'd prefer, UGC 5364 or PGC 28868) is definitely worth hunting down, although the Moon, nearing full right now, will probably push the effort off until next month. 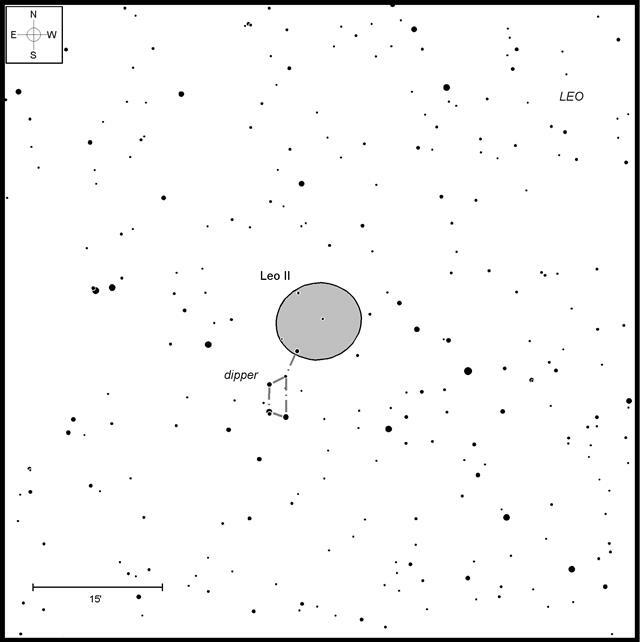 It's at RA 09h 59.4m, Dec +30° 44.6, 5° north of Mu (μ) Leo, the star at the top of Leo's "Sickle."